View of room at Fairmont Royal York with king size bed. 8th floor room in east wing. View of guest room bathroom at Fairmont Royal York with king size bed. 8th floor room in east wing. View of room at Fairmont Royal York with king size bed. 8th floor room in east wing. Toronto. An evening view along Front Street in Toronto. 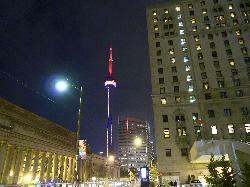 In view are Union Station, Fairmont Royal York and a colorful lighted CN Tower. 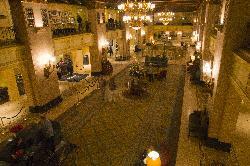 Mirror-like affect of the 8th floor hall way at the Fairmont Royal York. 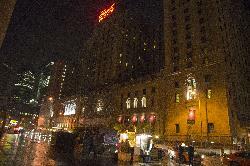 Evening photo of Fairmont Royal York Hotel in Toronto. Hotel was under some facade reconstruction. 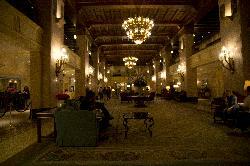 Photo of the historic Fairmont Royal York Lobby in Toronto. 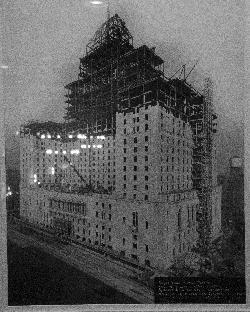 Photo of Fairmont Royal Hotel under construction in 1928. Original photo taken October 18, 1928. Previous hotel on site was the Queens Hotel, which was demolished September 1927. 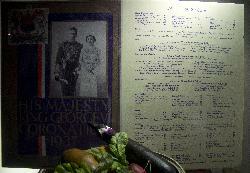 Display on Mezzanine at the Royal York.